SALT LAKE CITY – In a brazen announcement Friday morning, the Church of Jesus Christ of Latter Day Saints has released a new “Proclamation to the World” in what they have titled, “A Call for Zion.” The proclamation comes one day before it’s annual General Conference in Salt Lake City. More details will given by church leaders as the proclamation will be read and sustained by members in Conference on Saturday morning. President Monson was very cautious to let out any details of the angelic visit, or to answer questions about the new proclamation. He did inform us that the visitation came as an answer to his praying and pondering over a verse of scripture, D&C 70:14, which reads: “Nevertheless, in your temporal things you shall be equal, and this not grudgingly, otherwise the abundance of the manifestations of the Spirit shall be withheld.” There was no comment when asked if there was a feeling that there is an absence of spiritual manifestations within the church. This announcement is the biggest shift in the church since the controversial priesthood change in 1978. While that announcement was heard far and wide and the effects have been far reaching, this proclamation will affect every Latter Day Saint and perhaps the entire world. The proclamation calls for all endowed Latter Day Saints to live the law of consecration, reminding them that they covenanted to do so as part of their Mormon temple ritual. Perhaps this will mean a flood of high priced real estate will soon hit the market. Some of the major components of the big announcement include the following major changes. All church chapels will be converted into shelters for the homeless. Those with baptismal fonts and showers will be adapted into mens and womens bathing facilities. Those without such facilities will receive trailers outside with bathing facilities. Beds will be provided and separate areas for men and women, and classrooms will be provided for families. Deseret Industries will now provide clothing for those in need, no questions asked. All proceeds of the Deseret Industries will help in funding the new church converted shelters. Giving to beggars on Temple Square will no longer be discouraged, but encouraged. A great crowd of beggars receiving relief from those who enter the temple will be considered a great tribute to the charity of the people entering. The church has a large list of assets they are planning to sell off as part of the first stages of this monumental shift. Buildings, Large tracts of land, orchards, dairies, hunting ranches, and many other assets were listed in a forthcoming press release. The leaders emphasized that the church needs to set the standard and be the example to its members. Leaders of the church have a social media plan centered around the hashtag #call4zion to help flood the earth with this message. Leaders have asked that members prepare for tomorrow’s announcement by joining them in a fast and through much personal prayer. Are all the leaders going to give up their mega salaries and perks as well? We all know that these salaries range into the hundreds of thousands of dollars. When they make the announcement that this will happen, then I will know they are serious. Zion isn’t exactly a joking matter but thankfully this is just a joke. Whoever thinks an angel would come and instruct us to implement Communism doesn’t understand how United Orders are supposed to function. What would be wonderful is if we were able to consecrate our surplus so that we no longer have to worry about our wealth being stolen during the troubling times ahead. It would be so much better if the wealthy of the church sold their fancy homes and took the extra money and got a house that didn’t require any debt and that also enabled others to have their mortgages for their appropriate homes to be free of any usury. We could establish a common fund that would enable us as a people to completely withdraw from the Babylonian economic system. This system is going to implode and how many people will be able to sell their big fancy homes then? They will be rounded up and put in debtor’s prisons like everyone else who becomes enslaved by the Babylon system. There is much good that we could do if we did return to the Father’s economic system of United Orders in order to become one in temporal things as we have been commanded to do. Yes, Babylon would stir up persecution against us again, but that would be better than being taken for a spoil completely. You think on a much higher plain than most LDS, and yes, being free of debt is so important in these “last” days. The prophet Joseph always advocated this. A man can’t be free to do the Lord’s work if he’s a slave to the banks, (government) God will require all our debts resolved in this life or the next. April Fool’s! Right? I don’t think they live lavishly at all! The Church purchased a place for the prophet to live across the street from the LDS Church HQ Bldg. Is that bad? The prophet doesn’t own it. It’s a convenient place to live. You know that they had careers before they were called to serve, right? I don’t know how much you’re joking. I looked at Pres Monson’s house and it reminded me of my grandpa’s nice humble home in St. George. What do you expect? Do you want them to be completely homeless and live on the streets? I’m not sure why people have such problems with the prophet having a life before being called. If you had to focus your life on being concerned completely about where your next meal would come from or where you’d find shelter for the night, wouldn’t that be quite distracting from serving others? Whatever happens I will always sustain the living prophet of the Lord, President Thomas S. Monson. I sustain his Councilors and his Apostles. I know the Book of Mormon is true. I know the teachings of the Church of Jesus Christ of Latter-Day Saints are all true. I know the Lord loves us that he restored His gospel through Joseph Smith. That he always call for a prophet to guide us in these latter days. I know that our prophets has been given a priesthood which is the eternal power and authority of our Heavenly Father, a key for salvation and it is the access for blessings and power. I know the prophet loves each and everyone of us. I sustain him. I will always sustain him no matter what. I love him so much. Lester, you only mentioned Christ’s name once in your comment: in stating the Church’s name. 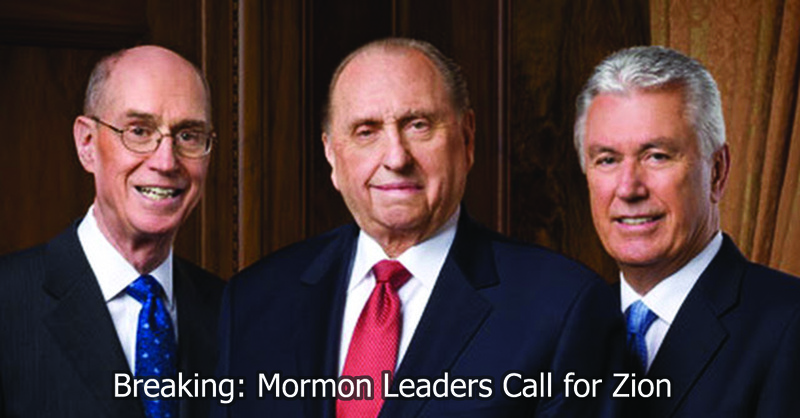 You express a great deal of love and devotion for Monson and the other 14 leaders. What about Christ? You express your feelings as though Christ is far far away, and that He calls leaders to help you bridge that gap between you and Christ, that somehow you need these men in order to have a personal, one-on-one relationship with Christ. What exactly is the foundational truth of your sacred testimony? What is the core truth that matters above all else? Your choice of words convey that you have placed your utmost trust in, and passionate dedication to, the LDS Church leaders far more than in Christ Himself, let alone trust in sacred communication from the Holy Spirit. I declare to you that the foundation of your testimony needs to be Christ, and Christ alone — not in any man, (even those called by Him), nor even in any institution, no matter if it invokes the name of Christ. If the foundation of your sacred testimony is not rooted in Christ — directly and unequivocally — it will eventually fail. Your love and passion and full trust ought to be directed to Christ alone — never to a man, ANY man — not even to Moses, Abraham or Joseph Smith. Do not use the leaders of the LDS Church as your personal spiritual crutch, even if they encourage you to do so. If you do not shift your love and devotion solely to Jesus Christ, and develop a powerful personal relationship with your Savior and Redeemer, your love will wax cold on the day you can no longer persist in denial of how flawed and carnal and purposefully misleading the current LDS leaders actually are. Brother, your own words demonstrate how greatly you need to repent and re-focus EVERYTHING on Christ — to make your eye, heart, mind, and passion single to His will and glory. Keys, priesthood, ordinances, “power”, authority, blah blah blah — those are all MEANINGLESS without one’s eye single to Christ’s will and glory. And yours is not. Throw off your spiritual crutch and walk with Christ — just you and Him. His Testimony is beautiful! Are you LDS? Do you know what we believe ? We love our savior and our heavenly father! We know they love us! We know we can have personal revelation and we can also recieve guidance thru the prophet and leaders of the church! We love them as well! We know that the things they teach us are true because we do talk with and indeed have a personal relationship with our heavenly father and our brother Jesus Christ! I am a 5th generation LDS, my great-great grandfather, Stephen Markham, was one of Joseph Smith’s bodyguards. I served an honorable LDS mission. I have an unshakable testimony of the Book of Mormon, Joseph Smith, and the restoration. I am an active LDS member. The time is long overdue that we LDS must wake up and realize that all is NOT well in Zion. We MUST scrutinize modern LDS culture, and objectively and prayerfully petition God to know in what ways, and to what degree, we have gone off-course over the past 180+ years. (It took only 300 years to go from Christ’s ministry and resurrection to Emperor Constantine hijacking all of Christianity and establishing himself as the first “pope.”) We LDS are NOWHERE NEAR establishing Zion; we are woefully distant from establishing no poor among us, precisely as the author’s brilliantly Jonathan-Swift-styled facetious article makes painfully clear. I love and adore Christ. I follow Christ. In response to years of deep ponderings and prayers for answers, He led me to information that I present in my two books (which He also led me in composing). I will listen to a man when He speaks the words of Christ. I will do what he advises if, and only if, it came from Christ. I will never put that man on a pedestal. I will never place my trust in him nor follow him. Christian Markham, I do believe not if you do really understand the Gospel of Jesus Christ..Being a RM or descendant to the bodyguard of Joseph Smith is a quiet honor but being an ANTI-Mormon is a great great HORROR. Amen, D Christian Markham. Very well stated. Christ/Yeshua should be the one we place our trust and not in the arm of flesh. Well, if your making a joke not in this way, don’t use the church please. think first! haha, got me for a second and then I read that Monson said he was reading the scriptures and angels visited him and realized this must be either a change of heart for him or they are trying to feign claim to priesthood authority and a “true church” through false prophecy’s. I am surprised though that they don’t just go ahead say things like this, why not? It would stop many of those who actually read the scriptures from leaving the corporation. I mean even though I know Monson is no “seer”, why doesn’t he just say he is instead of having his minions proclaim it? Good one. But I have a feeling they will continue to adorn their fine sanctuaries and playing the harlot to Babylon, after all it is the great and abominable church Nephi prophesied of. I can’t help but find it ironic you express your disdain and disbelief of the Church that brought about the Book of Mormon, while saying it exemplifies something listed in the Book of Mormon. Oxymoronic in many ways, not worth pointing out in greater detail at this point in time, because you are clearly just wanting to think truths 1/2way through in order to argue–exactly how the adversary prompts his disciples to see things. Sean, just one thought. The Church did not bring about the Book of Mormon – God did through Joseph Smith. The Church has as much ownership to the Book of Mormon as the Catholic Church has over the Bible (in my opinion). There is a way to accept the Book of Mormon as scripture and the word of God and still believe that the Church is in apostasy. The truthfulness of the Church isn’t determined by the truthfulness of the Book of Mormon, nor does it follow that Thomas Monson is a prophet. He could be a charlatan, and that wouldn’t affect the truthfulness of the Book of Mormon one bit. The Church could be in a total state of apostasy, and the Book of Mormon would still be scripture. There is no all-or-nothing-solution to these questions. Appreciate you sharing. Years ago my mom would say “Turn your wounds into wisdom”. Too funny! This is one of the most convincing April Fools prank published this year. First clue of it being rubbish; the source of the article. Kudos for being so knowledgeable and almost convincing! Dumb. Delete your blog and FB page before you embarrass yourself more. Why don’t you do the same? I love how some church members can’t take a joke. “More details will given by church leaders as the proclamation will be read and sustained by members in Conference on Saturday morning.” Here’s how to detect the truthfulness of this article. Notice the “will given?” Those who knew grammar knows this and a legit church article is usually flawless, not like this evil-driven writing. Ok, keep trying and by the way Satan did not go to a Grammar School, he was even denied to own a body. Honestly this was NOT FUNNY! I am currently an inactive member of the Church and don’t have a whole lot of respect for the men who call themselves called of God…but this was very low. Shame on you!!! 0nly ANTI-Mormon opposed the revelaton of God and even Jesus Christ. Although posted as a joke, this article is no joking matter and rings a truthful tone as intended. Compare the lives of the Apostles in the Bible, Acts 4, to today’s ‘Apostles’. A true Apostle would be ashamed to own a million dollar house on the golf course, its focus is against everything Christ taught. Then consider the ‘chief seats’ in the synagogue, I meant conference center. Plush couches for leaders, folding chairs for everyone else, a huge departure from the concepts of Zion, Oneness and equality. Do we mention the mall owned by the church? Do the leaders not read the BOM, yeah the part that mentions fine clothing being a stumbling block? But never mind that, I guess the GA’s wife’s needed a nearby place to shop while their husbands had meetings. And let us excuse the pay GA’s recieve as humble servants. You will say, it is not very much. It is all a PR game they play. Not very much directly from the tithing, true. But what pay do they recieve from the ‘for profit’ holdings of the church, for which they sit on the boards? They incorrectly separate the two to decieve, it is all the church’s, from which they up their pay. Who will profit from the new housing development in Florida? It should be land for a consecrated city, but that wouldn’t line pockets of the few. If this article were only true, I would come back to the church.